Looking for a creative way to wind up and manage your headphone cables? The Tetran is a cable wrap for iPods and other portable media players that allows users to wind an earphone cable around Tetran’s body and use her mouth as an earbud holder. 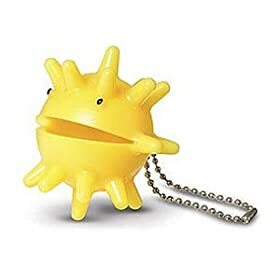 Spikes prevent Tetran from rolling away, and a removable ball-bearing style chain is included for attaching Tetran to a belt loop, cell phone strap, or key ring. According to Tunewear, the product’s manufacturer, Tetran’s 23 rubber spikes can also massage neck, hands, and feet. Really? Sounds like fun but I think I might pass on that idea. Call me crazy, but I don’t really want people massaging their feet with the thing that’s used for holding my earphones. The Tetran Headphone Cable Winder is a cute and colorful way to manage your earbud cables and accent your lifestyle. It’s available for $9 from Amazon.com. If the Tetran is a little too cute for you, there’s always the cheaper and simpler SmartWrap ($5). The SmartWrap works just like the Tetran, just without the cute spikes. Snap your earphone cord through the top fastener and wrap the length of your cord around the midsection, until you have the desired length.